Have you ever just had a "feeling" that you should read a certain book? Well, that's how I felt about THE LIGHT BETWEEN OCEANS by M.L. Stedman. This novel just kept popping up everywhere! It was on the August Indie Next List; and then is soon became a NY Times bestseller. It also received starred reviews from Kirkus, Booklist, and Publishers Weekly. I admit that all of the buzz made THE LIGHT BETWEEN OCEANS more appealing, but the book's description didn't hurt either. THE LIGHT BETWEEN OCEANS tells the story of Tom and Isabel, a couple living by themselves on a remote island who have been struggling to have a child. Tom is a lighthouse keeper who has returned to civilian life after four years of fighting in a war, and Isabelle is his young and energetic bride who has given Tom a reason to live. After multiple miscarriages, Isabel is more desperate than ever to have a baby; so when a boat comes ashore with a baby girl and her dead father, Isabel takes it as a sign and decides to keep the baby as her own. Tom is reluctant to agree to Isabel's plan, but he truly loves her and doesn't want to disappoint. While Tom is driven by a code of ethics in both his professional and personal life, he decides to go along with raising Lucy; and the family finds eventual happiness in their modest existence. However after two years, they return to the mainland and discover Lucy's true identity. They also learn that there are repercussions to their actions, and Tom is torn between doing the "right" thing and protecting his family. As I try to articulate my thoughts about this novel, I am finding that it's hard for me to summarize just how powerful of a story it is. I have so much I want to say about THE LIGHT BETWEEN OCEANS that I hardly know where to start. Probably the first thing that comes to mind, though, is the characters -- namely Tom and Isabel. They were just so real to me and the portrayal of their relationship was so touching. Tom was still reeling from his wartime service, and Isabel with her vivacious personality was just what he needed to heal. While I loved their courtship and early years of their marriage, I was especially impressed with how their relationship evolved through the years -- both the good times and the bad. Another thing I enjoyed about this novel was the writing. It was nothing less than outstanding and it is very hard to believe that this is the author's first novel. I loved her prose and her descriptions of the island and the ocean were so rich in detail that it stopped me dead in the tracks a few times. In fact, the imagery about the lighthouse was so vivid that the lighthouse actually became another character in the novel. And finally what I really loved about THE LIGHT BETWEEN OCEANS was how much it made me think -- not just about the story, but also about life in general. The characters faced so many ethical and moral dilemmas, and while it might appear obvious what they should have done, the author does a great job of making the issues blurry. I can't say that I always agreed with the characters all of the time, but I was able to understand their motivations and relate to their pain. 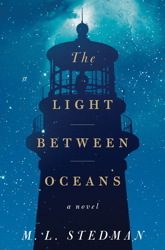 I could go on and on about THE LIGHT BETWEEN OCEANS, and that's one of the reasons that I think it would make outstanding book club selection. In fact, my book club will be reading this novel for November, and I can hardly wait! There is a reading guide available with sixteen thought-provoking questions as well as some suggested activities which can enhance your book club meeting. Some of the themes you might want to explore include infertility, family dynamics, love, loss, the effects of war, moral codes, ethics, responsibility, sacrifice, and guilt. In addition, you can talk about the meaning of the title as well as some other symbols that appeared in the novel. In conclusion, I highly recommend THE LIGHT BETWEEN OCEANS. It is a beautifully written and very complex novel that is not to be missed! I've had this one on my TBR for awhile now. I think I'm going to have to bump it up, thanks to your review. It sounds even better than I thought it would be! So many people are raving about this one! Wow, Tom and Isabel's decision sounds outlandish but I can see someone who is desperate to have a baby doing something like that. This sounds heartbreaking yet fabulous! This book sounds so intriguing and I am seeing it everywhere. Another book I need to somehow add to my long list. Loved your review, Julie. I have this book in my pile and hope to crack the spine before the end of the year. I have been meaning to read this since it first came out in Australia which was months ago. Must try to fit it into the reading schedule! I read your first sentence and said YES. I really, really want to read this. Then I jumped to your last sentence and am relieved to see that it's recommended. I am definitely going to get to this.